"We recommend that every assessing psychologist peruse and use this book as the definitive word on individual assessment as it is practiced in business and industry….This book is clearly the definitive reference on 'best practices' in assessment for selection, development, and succession. Practitioners, would-be practitioners, and students all should find this book indispensable. We feel that it is an investment that will pay handsome dividends to one's effectiveness in the assessment field." "This book will be highly interesting to practitioners interested in developing or refining their individual assessment practice. The authors provide a valuable compendium of 'best practices' and substantive advice on how to address the complexities and idiosyncratic nature of conducting, interpreting and reporting individual assessment results." "Individual assessment just doesn't get much publicity or research. 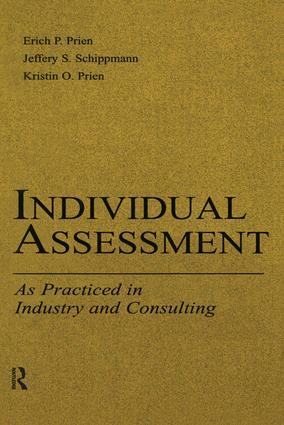 I hope this book will place a fine enough focus on individual assessment that its use grows substantially." "Erich Prien, Jeff Schippmann, and Kristin Prien have put together a remarkable book that draws on their rich, and varied, experiences over many years of management and executive assessment. The result is a clear, practical, research-based description of their approach to individual assessment. This is what the field has always lacked, a practical and methodologically sound model that can describe the diverse range of activities each step along the way and organize the diverse literatures that support and guide the assessment enterprise. This book will take individual assessment to an entirely new level of understanding and practice, and into a new era of professional research and activity." Contents: E.A. Fleishman, J.N. Cleveland, Series Foreword. Preface. Part I: The Practice of Individual Assessment. Introduction to Individual Assessment. Job Modeling. Establishing the Assessment Protocol. Conducting the Assessment. Integration and Interpretation. Feedback, Reporting, and Program Evaluation. Part II: Additional Issues Affecting Practice. Legal, Professional, and Ethical Issues. Final Thoughts and Prognostications. Appendices: Primer of Measurement Terms and Concepts. Management and Executive Model. Supervisory Model. Administrative Model.